MINNEAPOLIS--(BUSINESS WIRE)--Apr. 10, 2017-- Piper Jaffray Companies (NYSE: PJC), a leading investment bank and asset management firm, completed its 33rd semi-annual Taking Stock With Teens research survey, which highlights spending trends and brand preferences amongst 5,500 teens across 43 U.S. states. 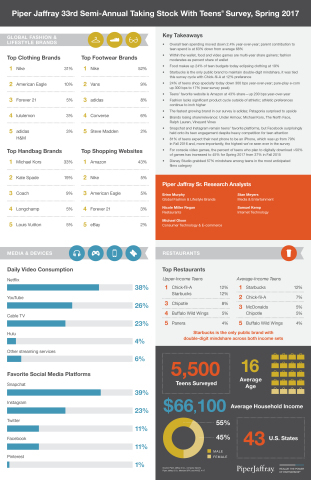 For an infographic and more information regarding the most recent survey, visit piperjaffray.com/teens. Since the project began in 2001, Piper Jaffray has surveyed more than 150,000 teens and collected over 38 million data points on teen spending in fashion, beauty and personal care, digital media, food, gaming and entertainment. Overall teen spending decreased 2.4% year-over-year. Parent contribution to teen spend is at 63%, down from the survey’s 68% average. Food is the most important category within a teen’s wallet at 24% of spend, eclipsing clothing at 19%. Fashion share of wallet moved down from 38% to 36%. Teens’ favorite website is Amazon at 43% share—up 200 basis points year-over-year. For console video games, the percent of teens who plan to digitally download >50% of games increased to 45% for spring 2017 from 37% in fall 2015. Starbucks is the only public brand to maintain double-digit share across all teenagers; it tied this survey cycle with Chick-fil-A at 12% preference. Athletic is seeing no slowdown with 41% of teens citing an athletic brand as their preferred apparel brand—up from 26% last year. Nike is the No. 1 apparel brand at 31% share—up from 21% last year. Adidas, however, is the fastest growing brand in our survey across footwear & apparel. Fashion brands losing relevance with teens include Under Armour, Michael Kors, The North Face, Ralph Lauren and Vineyard Vines. 81% of teens expect their next phone to be an iPhone, which was up from 79% in fall 2016 and, more importantly, the highest we’ve seen ever in the survey. Disney films dominated the most anticipated movies list with No. 2 “Beauty and the Beast”; No. 3 “Star Wars: The Last Jedi”; and No. 4 “Guardians of the Galaxy Vol. 2” grabbing the top few spots. “Fast 8” is the No. 1 most anticipated movie.